In 2001 the largest five companies in the world by market capitalisation were GE, Microsoft, Exxon, Citi and Walmart. By 2011 they were Exxon, Apple, Petro China, Shell and ICBC (Bank of China). By 2016 they were Apple, Alphabet (Google), Microsoft, Amazon and Facebook. What distinguishes GE, Exxon, Citi, Walmart, Petro China, ICBC and Shell from Microsoft, Apple, Google, Amazon and Facebook is that the former could all be classed as conventional and the latter can all be classed as post-conventional. So – what do we mean by conventional and post conventional? Essentially the differences comes down to outlook, leadership and culture. Conventional businesses have typically had the same business model for most or all of their existence Their vision (such as it is) is to get good at delivering on that business model, to be able to do what they say they are going to do, reliably. Some even proudly state a vision of “being the worlds best or number one X”. Conventional organisations have prioritised management and developed an obedient culture to keep cranking the handle. They may now be able to crank the handle remotely, over the internet, they may have outsourced cranking the handle to India or they may now crank the handle globally, but essentially cranking the handle is what they do. In a conventional business where reliability is the ambition, management is the key skill, because management is all about reliability, and leadership is annoying, because leadership is about change and change is disruptive. Many conventional organisations actively discourage signs of leadership. Post-conventional businesses change or augment their business model by disrupting other business models, typically by collapsing value chains. We can use Apple as an example of this – Apple invented the desk top computer and then disrupted it with the laptop, disrupted that with the smartphone/tablet and are now disrupting that with the watch. Along the way they have disrupted music, photography, video and more – in each case collapsing the value chain. To understand value chain collapsing think about photography – before digital cameras the photography value chain included standalone cameras, film, film developers and printers, then there were also stand alone digital cameras. By including a good enough camera in a smart phone and then selling them to huge numbers of people the whole photography value chain was collapsed to a single multi function device. What enables these businesses to do this is the way that they do leadership. Firstly they have a vision which is not about being the best at cranking their particular handle, but is about achieving something extraordinary and inspiring to all stakeholders. More important than that is the way that leadership is seen less as a person and more as a skill that large numbers of people need to be able to deploy alongside the skills of management and followership. People dance between the three so that when something needs to change the skill deployed is leadership, when something needs to be kept reliable the skill deployed is management and when someone else does something inspiring followership is deployed. That leadership, management and followership is interdependent and authentic, meaning that there are high levels of psychological safety and trust and crucially vulnerability. Vulnerability is the essence of leadership because leadership requires us to take a position without knowing what the outcome will be. This is as true for the Wright brothers flying the first plane in 1902 as it is for any of us standing up for what we believe to be the right thing in the face of opposition or apathy. The feeling we have is vulnerability, when we choose to lean in to that vulnerability rather than running away, it is an act of leadership. When someone follows us it becomes leadership. Without a combination of psychological safety and a willingness to be vulnerable, no one says what is really on their mind, no one shares their crazy ideas, no one does anything that no one has done before. In post conventional organisations we must embrace the anarchist in as many of our people as possible. We must be able to recruit, retain and develop individuals we find a little bit annoying. We must nurture leadership wherever and however it appears and encourage it to align with our vision. Conventional organisations find innovation so disruptive that they tend to isolate it, in its own special unit, quarantined from the rest of the organisation to prevent the anarchy from infecting others. Post conventional organisations have to find ways to be agile to marry reliability and disruption not just in the same organisation, but within individuals. We must think like the Kung Fu master, always disciplined with our own habits and emotions always looking to improve ourselves, always encouraging discipline and brilliance in our colleagues. For many conventional businesses the only alternative to self disruption is to be disrupted by others. The only consequence of exclusively managing reliability is that you are in fact managing decline. It is also worth saying that post conventional organisations are also run by humans and, as such, they too are vulnerable to hubris and stealing from the future. They too are vulnerable to ruler and boss style leadership and at the point at which they succumb to these temptations they too are managing decline. There is a great deal written about how to create success, both for individuals, teams and organisations, but some of our experience suggests that success will come along quite easily if we can just avoid creating the circumstances for failure. The first part of this is to acknowledge that we humans are emotional creatures. It has long been fashionable to resist this particular insight, especially in work type situations, where “being professional” is taken to mean suppressing emotions. Suppressing emotions is both unhealthy and unsuccessful as emotions will always leak out in some way. As a result of this fashion not enough of us are skilled at either understanding or regulating our own emotions or adequately reading the emotions of others. Emotions are our body’s way of communicating with our brain. 0.07 seconds after some stimulus our body is already reacting, producing hormones and sending messages to our heart and muscles. It takes at least 0.5 seconds for our brain to catch up – sometimes much longer, or never. When we play tennis or react to a situation while driving, we do much of it with “pre-conscious” skill, our body uses muscle memory to deal with the situation before our brain has even registered something is happening. These same processes take place when we walk into a meeting and realise we are un-prepared or that someone is blaming us for a mistake. Our body makes a decision about whether this is good or bad and floods our system with hormones accordingly – but not necessarily correctly. This flood of hormones can then lead, after half a second, to a more conscious, if unintentional reaction. Our brain gets triggered and the collaborative, interdependent, trusting and vulnerable version of ourselves gets replaced by the independent, suspicious, competitive version of ourselves, or in extreme cases the dependent victim version. This triggering happens moment by moment. In one conversation or meeting we can swing from interdependent to dependent and back again. However, our observations of multiple organisations under stress suggest that it can also be infectious and affect a whole organisation for a prolonged period of time. What can happen when stress arrives is that a number of senior people might react badly, becoming blaming others and protecting their own status. Maybe they even sack people they believe to be the problem. The triggering quickly rampages across the organisation with normally interdependent and collaborative people quickly becoming independent and feeling they need to fight for status in order to be safe, or becoming dependent and just waiting for instructions from someone in authority. The solution to this is twofold; we have to become aware that this is what is happening and develop our own emotional literacy, then we have to introduce new more helpful habits of thought and behaviour to replace the unhelpful habits. Overall we call this shift – Reaction to Response. We cannot immediately change the way our body reacts to a situation, but we can cultivate the habit of taking the time to consciously interrogate the reaction in order to understand it and respond to it intentionally rather than unintentionally. It works like this – the moment we notice that our body is reacting in a potentially unhelpful way to a situation we pause – at a minimum take a deep breath to oxygenate your brain and take some time to think. If it is a stressful situation in a meeting – get or offer a glass of water, drop a pen, spill the water – anything that will buy your brain the time to catch up. Focus your attention on the outcome you actually want to achieve longer term, rather than short term self defence. If the situation is being caused by someone else being emotional with you – deal with the emotion first. Rather than trying to use rational arguments to talk them down, work out what is upsetting or angering them and deal with that. This is really challenging, our programming that we don’t do emotion at work is so strong that when someone does, we still try to deal with the situation rationally. When we are trigged in this way we become a less mature version of ourselves, we become independent like a teenager, dependent like a child or selfish like a toddler. If we want to de-escalate a situation where someone is triggered, we need to deal with them where they are without being patronising and we also need to avoid being triggered ourselves. If they are triggered to being independent, we need to show that we are on the same side as them because they will see the world as being against them. If they are triggered to being dependent we need to help them have the confidence that they can solve the problem. If they are triggered to being selfish, we have to hold firm that other people matter. One of the psychologies that often drives these dynamics is a bias known as “Fundamental Attribution Error”. What this says is that we are far more likely to attribute errors in others, particularly those we are not close to, to character flaws than to circumstances. In other words we tend to associate failures with who someone is rather than how they are. When we combine this with our continuous vulnerability to being triggered, it is easy to understand how we can come to see someone, who is frequently triggered by the culture at work, as being a fundamentally selfish character. Equally, if they notice us thinking that way, they are likely to see us as a fundamentally judgmental character. The reality in both cases is that this is how we are, not who we are. To tie all of this into organisational performance. Organisations that enjoy sustained success are those where people are collaborative, creative, transparent and supportive – to the extent that they would challenge poor decisions or behaviour skillfully even if that meant challenging upwards. In order to sustain that kind of culture leadership needs to role model those behaviours and intentionally create an environment with high levels of psychological safety. This means receiving feedback and bad news well, supporting people even when you find them a bit annoying and working explicitly with people on “state awareness” and “emotional regulation”, so that people understand when they or others are triggered and know what to do about it. As you may notice, this is a huge subject and distilling even a part of it down into 1000 words and still making it valuable is challenging. Typically we would take all of a two day workshop to teach the ideas outlined above in a way that enables people to create new habits and deliver sustained success. At Holos our primary focus is on culture. We help organisations address the fundamental challenge: how do you intentionally create and curate the kind of culture that delivers sustained success in a disrupted environment. Our end game is authentic leadership, but just as important is how this is expressed through the brand – and how the brand informs the culture. The reality of any brand (regardless of the fevered aspirations of the marketing team) is how people experience the organisation. If I as a customer experience the automated phone system as complicated – that is the reality of the brand for me. If an employee experiences a chaotic organisation, that is the brand for them, and if employees experience chaos it is likely that customers will too, since you cannot create reliability externally, if you do not create it internally. So regardless of whether a platform is formed as an automated, dynamic and cutting edge brand, it is the lived experiences of that brand expression that defines the brand in its thousands of interactions with people, externally with customers, investors, suppliers, press, partners, and internally with leaders, managers, makers, sales people, HR, new hires. Even office dogs. At Holos we are privileged to have a diverse team to work with. Hanne Klintøe is one of our agents, who brings incredible experience and expertise from the exact cross-field between brand and culture. I have asked her to contribute to this post and dig further into how the two interloop – so here’s Hanne. To direct a fleet through a disrupted environment, you need a workable compass. You might think that is your strategy and firm leadership, but think again. Come storm, broken sails and high waters, nobody has time to read your strategy deck and they can’t see you through the waves. The only real go to is a strong culture striving towards purpose, constantly adjusting direction through the strong compass that is brand. But hang on. What do we even *mean* by culture? On a societal level, we recognise culture in the food we eat, the clothes we wear, the traditions we keep, the way we meet and the expression of it all through activities, art, media, language. Culture is the living expression of shared values and beliefs and it’s what you get wherever humans are brought together around a mission – any mission – whether you want it or not. It lives through the feedback loop of action-reaction and how these iterations affect what we believe, value and connect with, and as such it develops continuously, through thousands of small manifestations and adjustments, every single day. When then CEO Alan Mulally set out to save Ford during the 2008-10 automotive crisis, he faced an organisation riddled by fear. Losing a job at Ford meant unemployment. There were no other jobs to be had in the entire industry. The fear was real and created a culture of secrecy and rivalry, hiding system failures, short-comings and mistakes and tearing the organisation apart. 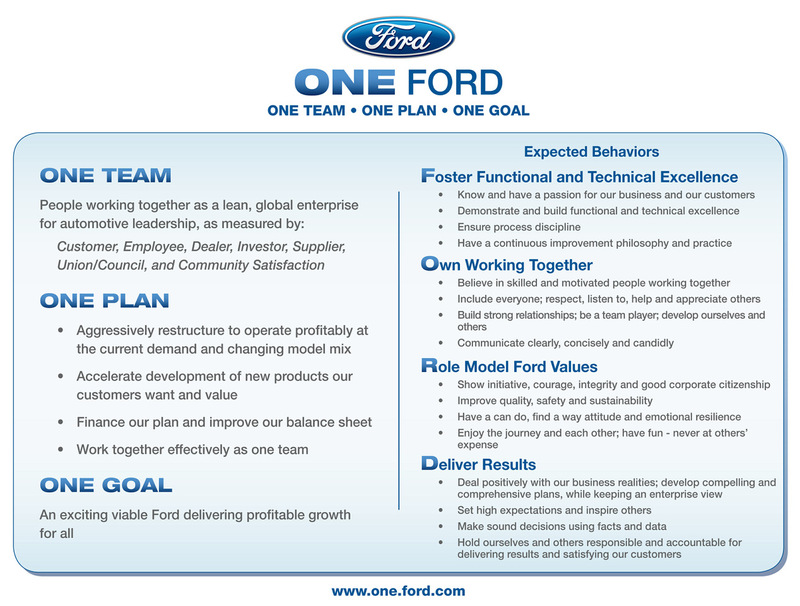 Mulally’s solution was the vision ‘One Ford; One Team, One Plan, One Goal’. It revitalised the brand according to Henry Ford’s original vision of a people-centric organisation innovating for a better future for all. Somewhere along the way Ford had become disconnected, and Mulally developed the tool that would reconnect the company as one, and plug it right into actual customer needs. Through a meaningful, connected brand, Mulally could cultivate an open and supportive in-it-together culture of trust that would. to replace the closed, secretive culture of fear and rivalry. His first initiative was to open all management meetings by celebrating mistakes. One by one, managers would share problems or failures and their disclosure would be applauded. “Great! Now we know!” Then, as one team, they could act on it. The second was updating team-structures and launching 16 ‘expected employee behaviours’ supporting the vision, which were printed on the back of the company access cards. The vision was outlined on the front. What Alan Mulally did was not only to launch a new vision for the organisation, but also reconnect and revitalise the brand and activate it into a culture, that made sense and was supportive for all employees. It became ‘a Ford thing to do’ to help and appreciate others. To celebrate failures as a route to solutions. To believe in one another. So activating the brand into a culture of defined beliefs and behaviours, he unified and empowered his people throughout the organisation – and the crisis. You might still ask what exactly makes a brand so powerful. Can’t you just tell people how to behave? Er, no. That’s called dictatorship and cannot deliver sustained success. The value match between brand and individual is one element of the answer, but the real power of the brand is that it ties together all that your organisation does – from purpose to method and offer – into one conceptual expression, and as such serves as an applicable guide to “What the h*** am I doing here?”. As humans we organise ourselves around meaning. Where there is none, we make it up, and group around ways to enhance it. Our brains are built to guide that behaviour. Always confirming what we believe, altering it to environment feedback. When we direct cultures through the compass of a brand, we enable meaning to collect around intentional parts; values, beliefs, purpose. ‘I’ becomes ‘we’ when work makes sense. Translated into behaviours, organisational routines, meeting formats, team work styles, support mechanisms, expectations and celebrations, we can enhance the meaning, even when we have fun, chat with team mates or share a meal. The branded culture becomes a deliberate, agile, and completely coherent structure directing the living organism of your work place, even as it is renewed daily through thousands of interactions. c) human – using language and symbolism that resonates emotionally (enabling belonging). So a branded culture can help fulfil the fundamental human needs for safety, connection and belonging in the work place, enhancing trust and openness, but also open up for self-expression and self-realisation in a match on values, beliefs and purpose, feeding both innovation, motivation and drive. Culture is what makes your organisation come to life every day. You can use your brand to direct the organism it embodies and establish coherence, even through chaos. Or you can deal with a wild beast on a daily basis, not knowing where it’s heading or why. Culture leads your people, whether you want it or not, so build a culture with intention through authentic leadership and on the basis of your brand, and you have a living organism with a workable compass that will drive your mission with conviction every day, in all interactions. Wishing everyone sustained and sustainable success in 2019. We had the great good fortune to be able to spend our New Year in India. We chose India because we wanted our children (13 and 15) to appreciate that their life in the UK is not “normal”. We flew to Delhi and then did the so called “Golden Triangle” via Agra and Jaipur back to Delhi with a stop in rural India to visit a game park and see tigers. India is a fascinating and beautiful country, which is highly likely to become the dominant economy of the 21st century. It has a population of around 1.3 billion with a median age of about 27 (Europe is over 40) and a 300 million strong middle class (larger than the whole population of the USA). (see the Ageing chapter of Stealing from the future for more on this) The people are hard working, resourceful and remarkably calm, they are also kind and helpful. From my personal experience they value education more highly than any other country of the 35 plus I have worked in. The palaces built over the last thousand years are more opulent than any of their contemporaries in Europe. The visible poverty in both towns and villages today is extreme and distressing. The air quality in the cities at this time of year is frightening, with pollution visible even indoors, but then it was only in the 1950s that Londoners had to contend with smog that killed thousands. Religion is important and Hindus have over 30 million gods to choose from. Perhaps because of their religion attitudes are very different to Europeans and it is particularly visible in the way they drive. When driving it seems that there is a responsibility to ensure that every available bit of road is used, it is best if traffic always keeps moving at a steady pace and road markings are largely for decoration. Overtaking is done whenever and wherever and oncoming traffic accommodates it. If you only have a short distance to travel it is OK to go on the wrong side of the road, especially if there is a solid central barrier in the road. Road users appear unperturbed by cutting in. Hooting is essential, in a friendly just letting people know you are there kind of way. Remarkably it seems to work fairly well most of the time and that is more down to the tolerant, live and let live attitude than to rules or driving skill. We appear to be very vulnerable to manipulation by extreme displays of wealth. The Mughal Emperors (Muslim kings descended from Genghis Khan and the Mongolian rulers of Persia) and the Maharajas (Hindu kings of regions of India) built fabulous palaces which ostentatiously displayed their wealth and power. The common response to these wildly excessive disparities of wealth is to either subordinate to it, ally with it or occasionally to be inspired by it. What rarely appears to have happened in India or elsewhere is, what might be a more rational response, which is to collaborate with the masses to negotiate a fairer share of the wealth. The lesson is perhaps to believe in ourselves more. We don’t need rich and powerful patrons to create sustained success for ourselves, in fact on the whole they are only interested in their own success, not ours. Rather than supporting Rulers and Bosses who only care about themselves we should support Integral and Authentic leaders who care about our shared future. To a European visitor India feels chaotic, noisy and intense. For the locals it is normal, but they also appear to be unfazed by it. There is a Buddhist saying (Buddhism and Hinduism are closely related) “If you can do something about it, why worry? If you cannot do anything about it, why worry? This balance of fatalism and resourcefulness is deeply ingrained in the Indian psyche. The lesson is to accept the things you cannot change with good grace and at the same time to be resourceful, determined and creative about changing the things that need to be changed and can be. We didn’t seek to discuss politics while we were there, but the conversations seemed to happen anyway. India has a somewhat populist Prime Minister Narendra Modi, several people we spoke to were supportive of Modi citing his anti corruption and infrastructure focus as being positive for India. Another person we spoke to said that the focus on infrastructure was very much at the expense of the environment, wildlife and climate. The lesson is that effective leadership of an organisation or countries is badly compromised if it is evaluated on the basis of short term popularity with any stakeholder group (this is a real challenge for democracy). Leaders have to find a way to ‘sell’ a sustainable long term vision, even if it requires some unpopular compromises to get there. The great challenge of being an Integral leader is garnering sufficient short term support to deliver the value that is almost always in the longer term. Starting in 1911 the British moved the capital of India from Calcutta to Delhi and built New Delhi as a planned city, adjacent to Old Delhi and designed by Edwin Lutyens. New Delhi is almost a 1930s version of Milton Keynes – all wide avenues and roundabouts. Vast government offices (see lesson 1 above), parliament and the Viceroy’s palace were the centrepiece of New Delhi. British rule in India lasted for only another 16 years before independence. Independence was in no small part influenced by the Integral leadership of Gandhi. The lesson is there are great risks in believing your own propaganda, as leaders we must find the skill to appreciate even critical feedback and also to examine all of our decisions, not just for their potential outcomes, but also for the motivation that lies behind them. In contrast to monotheistic religions Hinduism is extremely diverse and appears to tolerate a very individual approach to which god or gods if any a Hindu worships. Hinduism is a set of ethical principles and lifestyle choices designed to create a life that is positive for the individual and the community. The lesson here is that as an Integral leader we need to honour a broad range of stakeholders and understand their different perspectives and priorities. There are the normal stakeholders of customers, employees, shareholders etc and there are less culturally accepted stakeholders like “the future” and “the environment”. We need to do our best to serve the interests of all of these stakeholders medium to long term interests and avoid being sucked in to focussing excessively on a minority of them or on the short term. Please follow the link to find our Holos Christmas card, wishing all of you a very happy and easy Christmas this year.